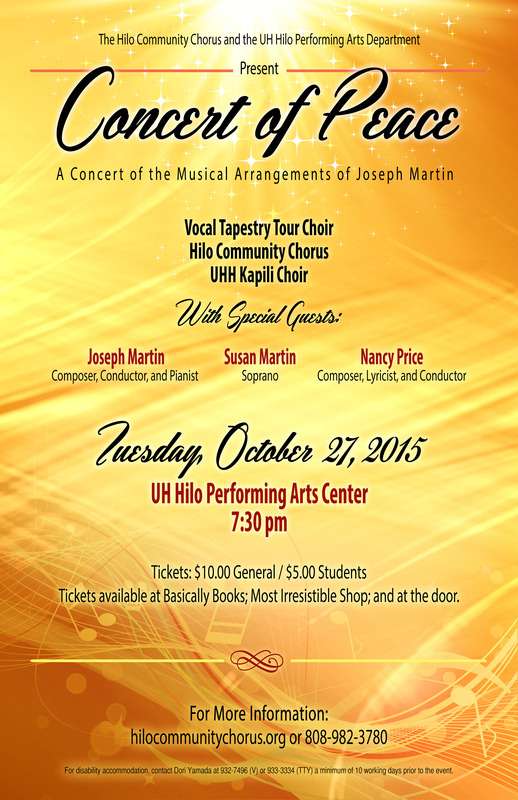 At 7:30 PM on Tuesday evening, October 27, 2015, the Hilo Community Chorus joins with composer Joseph Martin and his “Peace in the Pacific” Vocal Tapestry Tour Choir, and the UH Hilo Kapili Choir to present “Concert of Peace” at the UH Hilo Performing Arts Center, 200 W. Kawili St., Hilo, HI 96720. 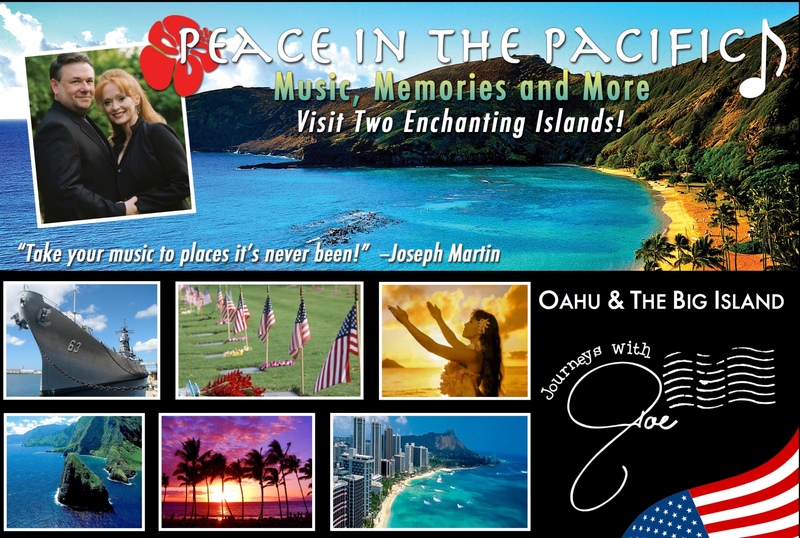 The first half of the concert will be presented by Joseph Martin and his wife Susan Martin, with special guest Nancy Price. The second half of the concert will be performed by the Vocal Tapestry Tour Choir, Hilo Community Chorus, and UH Hilo Kapili Choir. JOSEPH MARTIN has performed solo piano recitals and has been the featured artist with symphony orchestras in the United States and Mexico. Recognized throughout the United States for his many choral compositions, both sacred and secular; over one thousand compositions are currently in print and the list continues to grow. His music has been heard in such diverse locations as Carnegie Hall in New York City; the Lawrence Welk Theatre in Branson, Missouri; and in hundreds of worship services in churches across the United States and Canada. In recent years his concert itinerary has taken him to Canada, Italy, Scotland, England, France, Germany and Austria. SUSAN MARTIN was discovered by legendary choir director Fred Waring and toured as principal soloist with “The Pennsylvanians.” Later she began an almost twenty-year run as an actress and performer at Walt Disney World. She has sung for millions of people as a member of the “Voices of Liberty” at Epcot Center and appeared in numerous musicals and shows including Broadway at the Top, The Hoop-de-doo Revue, and many lead roles in regional theatre. Her credits include The Music Man, A Little Night Music, It’s a Grand Night for Singing, Phantom of the Opera, and many others. She has sung at The White House, Lincoln Center, Kennedy Center, Carnegie Hall, and in numerous churches and concert halls across the country. She was a featured performer on the inaugural cruises of the Disney Cruise Line and is perhaps most recognized for her portrayal as Ariel from The Little Mermaid for the stage show version of this Disney classic. NANCY PRICE holds Bachelor of Music and Master of Music degrees in Music Education from Ithaca College and, for several years, was a high school choral director. She now works as a free-lance music engraver, editor and proofreader. She is a member of the prestigious Lyric Chorale and frequently performs as a soloist. She has also gained wide recognition as a choral clinician and festival conductor. Nancy is a member of Sigma Alpha Iota and ASCAP, and is the recipient of several ASCAP Plus Awards. The UH HILO KAPILI CHOIR is conducted by Amy Horst (most recently seen onstage at Hilo’s Palace Theater as Mary Poppins). The Kapili Choir gathers and unites students from all majors at UH Hilo, representing a wide variety of cultures, languages, and backgrounds. tickets are $10 general / $5 student and can be purchased at Basically Books, Most Irresistible Shop, and at the door.